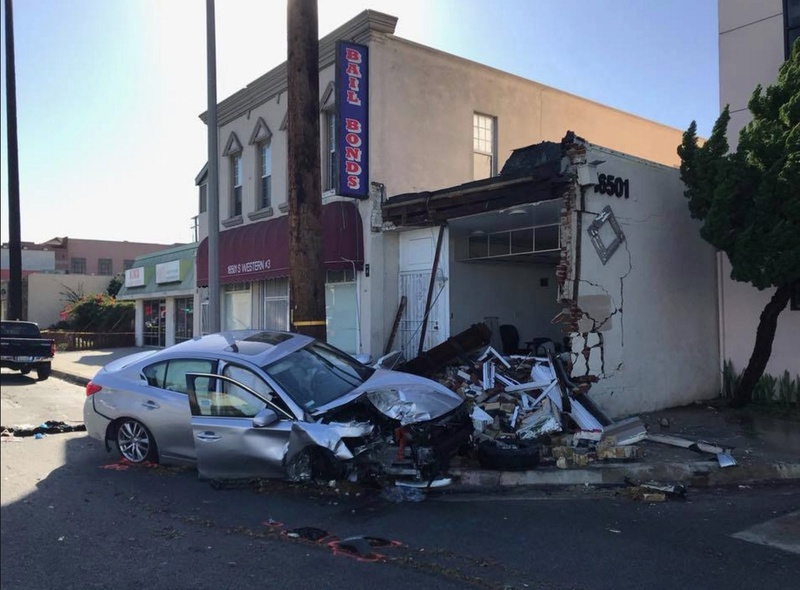 GARDENA — Road rage appears to have led to a collision and crash into a storefront that killed a motorcyclist Thursday in Gardena and resulted in a 24-year-old man’s arrest on suspicion of murder, police said. Officers were dispatched about 12:15 p.m. to investigate a report of a collision between a car and motorcycle in the 16500 block of Western Avenue between Gardena Boulevard and 166th Street, according to Gardena police Lt. Mike Saffell. The preliminary investigation revealed the motorcyclist was riding south on Western and “became involved in a conflict with a male driving a 2017 Infiniti Q50 sedan,” according to Saffell. “The conflict escalated when the sedan and the motorcycle collided in the roadway causing both to veer into a storefront in the 16500 block of Western Avenue,” the Gardena police detective bureau commander said. The Infiniti driver, identified as Oscar Villa of Hawthorne, was arrested and booked on suspicion of murder, Saffell said. Villa was being held in lieu of $2 million bail and was due to appear on Tuesday in court in Torrance, according to sheriff’s inmate records. The deceased motorcyclist was identified as Jaylen Ramon Bell-Maxwell, 21, of Los Angeles. Anyone who witnessed the collision is encouraged to call Detective David Choi at (310) 217-9635. Reference report number T17-6923. The bail bonds business that was struck by the two vehicles is across the street from the Okinawa Association of America’s buildings. The crash occurred between Nisei Inn to the north and such businesses as Kiku Florist and Otafuku Restaurant to the south. The street was reopened around 6:45 p.m.